Set yer charts and keep the date open! 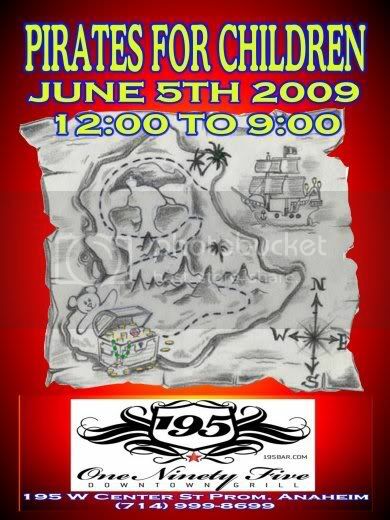 The annual *Pirates for CHOC* Event is scheduled for Friday, June 5th in Anaheim! Come out and shop the Vendors, bid on items at the Auction from Disneyland, POTC writers Ted and Terry, Ahmet Zappa, Haunted Mansion memorabilia, Disney Pins, meet and get autographs from many actors from POTC and more. Much, much more! The event will have longer hours this year so there is little excuse to not find a bit of time throughout the day and night to come out and support this very important event. This year the Hospital visit will be in the AM so we will have even more time to raise money during these longer hours for the event. The CHOC Hospital visit will be in the AM this year, giving us even more time to raise money during the longer hours of the event. More time for Vendors too! Come and shop! Come and visit and come out to support the cause. You never know what treasure you may find… or what might find you! It is all of you that make this work. It’s your generosity and skill and good natures that make it all possible. And the kids know it and so does the Hospital. More info when we have it… put the date aside and step out smartly over to Anaheim and join the fun! Interests:My interest is becoming a one percenter so I can laugh at the 99 percenters. HAHAHAHAHAHA, Wow, guess I made it. Yo Ho. We have gone to this event for the last two years. It is excellent all around and a great way to raise money. If you are in the area, please come out and support it. The only thing I’d somewhat grumble about is that Club 195 had non-pirate things booked right after the pirate activities. This meant that the pirate fun came to a rather abrupt end. Do you know if they have done that again this year? This is a great event and I hope they raise a lot of money. Hope the wench auction is a go for this year as well! You never know what treasure you may find… or what might find you! I Knew It! I Knew It I Did!! That Slimy Tentaclely Thing IS Seeking Me!!! ...Aye, this is a GREAT event indeed 'n for a really great cause as well! but....Bring Plenty O' TARTER SAUCE!!!! I do not... but I can certainly find out lad! Certainly hope to see you again this year! Aye, I says this time we load that cannon fer real's 'n if they get up on that stage 'n takes t' caterwaller'n again we just point it at them 'n stand our ground - after all, WE BE PIRATES! Make 'Em Dance In The Jig We Will!!! ....besides, all them other "PC" groups say it "it be for the children's sake" - But WE really Mean It!!!! Do you remember the name of the group that was playing? Or... when they came on? Did they play Rock or Pirate music? It was a dance group (not affiliated with pirates) and not a band as I recall. T'was a lot o' scream'n, but not that o' victims be'n pillaged 'n plunder'd, much worse it twas....like ally cats be'n run over by a steam roller then drag'd down th' street by their tails. I think they came out right after th' last o' th' raffle was over, but much before I finished me drink...could no longer have a conversation with anyone, even when we tried screaming, so we finished our drinks, in much hurry, then left. Certainly not a pirate group, even Bilge Munky would refuse t' play that noise, 'n he pretty lenient when it come t' 'noise'. Is there a website for this event? The one from last year is not working. THis event is a week from this Friday!! What time is the event? Is there some sort of schedule? 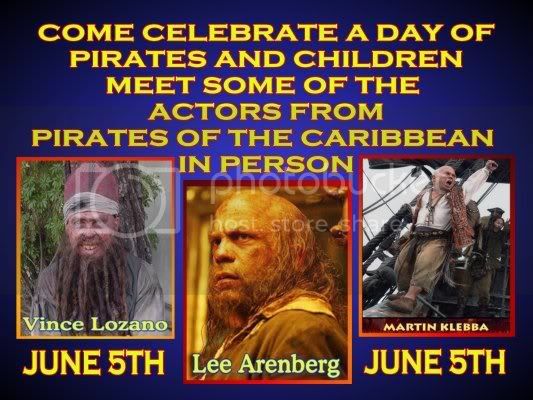 Please remember that the Actors schedules may change and they may not be able to come at the last minute but... as of now we have even more Pirates from the film coming out to help with the event. Come out and meet your favorites. 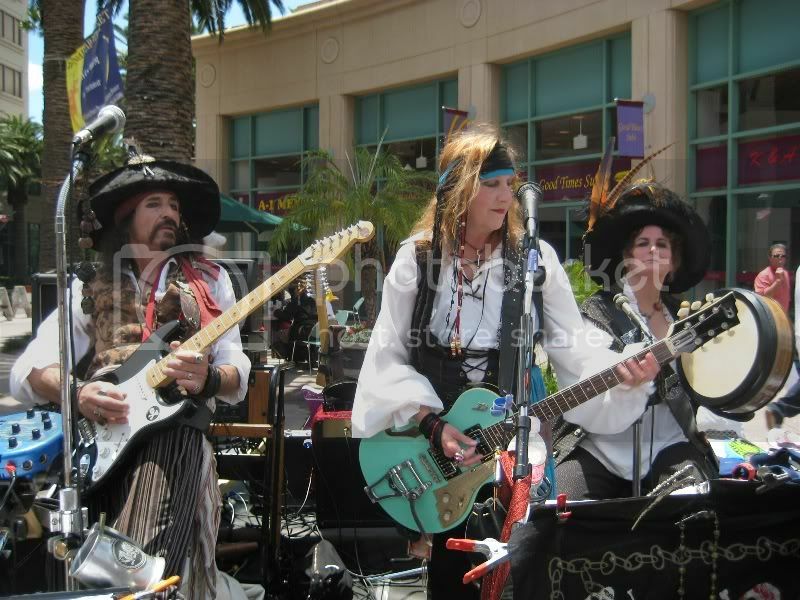 There will be several bands on the stages including the Doxie Chix, Pirates of the Black Swan and so many others! Music from 12 Noon until 8PM. There will be a silent Auction including signed DVD's of the Pirates films by Ted and Terry and also a signed *Cast gift* that was given only to cast members. Custom leather works by Barbossa Leathers (you all know how high tone THAT stuff is!) and much, much more. Lots to see and do so come out if tou can and enjoy the day and evening for this worthy cause. Come on out and have a great time for a wonderful cause and meet yer Pyracy Pub friends!!! I'll be there around noon but can only stay until 3pm. I be setting sail ta arrive in port around 6 bells or so. Me lady Capn' and me sister will be a comin' as well. And check out the bands as well... Music from 1PM to 9PM and I have been asked to play along with both the Doxie Chicks and Pirates of the Black Swan tomorrow. Keep a weather eye out mates! We all know that times are hard... but everything we raise will help with a differnt kind of recovery for these families and the children they so love. To too late to sign on. Since no swab or lass has scribed a review of said event, I guess it fall ta me. Me lady Cap'n works for CHOC through another medical facility and she had one question. Neither this year nor last year was anyone at her office told about this event. Was CHOC not sending flyers to thier partner companies? I guess not....then on w' the story. Anyways, at least it wasn't sunk [cancelled], but I hopes next year will be better given more publicity and that maybe there will be more loot [vendors] and a few o' our other mates. No offense ta those who did this here event, I'm dead certain ya did yer best. No matter how hard you work (And Evan worked his keel off) it all comes down to Charity events, you are depending on the word of others and when they don’t keep to their word there is little you can do. Several Vendors just never showed up... That has no reflection on how hard an effort was made to make it a good event. And all the pirate/Pirate Music was much earlier in the day. They only had the more Rock based stuff for evening and one band was non-cooperation incarnate. They wanted to swear and be foul mouthed as was their custom, forgetting this was a Kids event (which they had agreed too before hand) so there you have keeping to yer word again. We had plenty of Jacks though! Still… the daylight hours saw allot of fun! Still, the day raised allot of cash for the Hospital (I'll post the final tally when or if I see it) So... all was not for a loss. We were not allowed to put Minimum Opening Bids for the items in the silent auction. I had brought signed items from Ted and Terry, plus some crew gifts that had gone to only actors in the films at completion and they went, I am guessing, for next to nothing. They could have brought in a great deal on eBay. Interests:Pirate, nautical, navigational, and colonial history. Co-Founder & editor of No Quarter Given in 1993. Also co-founder of Port Royal Privateers in 1993. Maker of politically incorrect and piratically correct buttons. Other interests: cartography, costuming, hiking, music, art, bicycling. There were only 3 vendors and a band. Whilst the band was good enough fer modern pirates, I was a hopein' fer more piratey music. You say you didn't arrive until 7 pm. The party started much earlier. The event started at NOON!!!!! There were piratey bands playing earlier in the afternoon, with lots of piratey music ... Pirates of the Black Swan, and Doxie Chix for example. The Pirates Charles played too (not sure if you consider them piratey or modern ... I figure they are both, sort of pirate Metallica. The band towards the end, Mommy's Little Monsters, was mostly modern cover tunes. So offering something for pirates and modern music lovers alike. As for the lack of vendors, aye, we could have used more. I tried to help Evan by sending off messages to many of the vendors I know. But with the Big Bear Pirate Fair and Valhalla Renaissance Festival the same weekend, many of the other vendors I tried to recruit were off at those events. To get someone to come set up for a few hours of sales on a weekday afternoon is tricky. The auction had been in the bar last year with quite a few items fer bid, me lady and I won a brunch at Marie Calanders, but this year twas outside. These were so well hidden [although in plain sight] that I ne'er even saw 'em till twas too late. Me purse was empty anyways. Maybe you didn't notice the auction items at first. More announcements throughout the day might have helped. But as auction was drawing to a close, you couldn't help but notice them, for announcement after announcement was made, reminding people to get their bids in. True, maybe by that time it was hard to push through the crowds to see what was there. Also the fact they couldn't take cash but only checks made out to CHOC (due to legal problems from some crazy lady the year before) made it harder. In this age of ATMs, people don't carry checkbooks around with them as much. I forgot to bring my own checkbook, and thus had to mail a check in on Monday. True, last year's party had a few more vendors, but I think this year's party had much better offering of music. With the stage out on the street, but within easy view of the bar's patio, I think that really opened things up, rather than keeping the music inside the crowded bar. Remember ... this was a FREE event (you didn't need to pay anything to attend), organized by an all volunteer crew. *Ducks flying crockery* I beg yer pardon lasses, I just reports 'em as I sees 'em. We came at the same time last year, so's I compared the two o' 'em based on that. Likes I said at the end, "No offense ta those who did this here event, I'm dead certain ya did yer best." th' day. Most of us workin' pirates caint come til after we gets back ta' port. I clean forgot 'bout Big Bear. P'haps this should be set when there are no other events running concurently [means at the same time]. This hasn't put me or me crew off o' comin' again. Finally, I apologise again fer any unintended insults. I KNOW ya did yer best.....I still enjoyed the time we spent, even if it weren't as much fun as last year. I was more thinkin' bout the newbies I had brought, who left after a few minutes, cause there weren't nothin' goin' on that they could participate in. 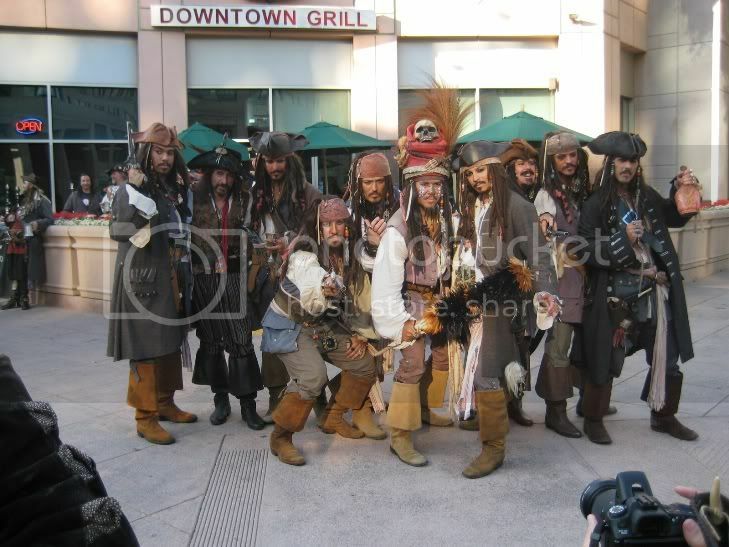 With few vendors and [to some], the wrong kinda music, hardly any POTC characters left by then, they were disapointed. I had built 'em up so much bout last year, I guess it be my fault. Goin' futher me lady Capn' says she will try and promote this at her work next year and I will post about this more vigoriously on the boards I post on. Maybe that will be of some help. We well be here next year fer certain. Anyway, can ya forgive this ole pirate, who maybe shoulda kept his big mouth shut!